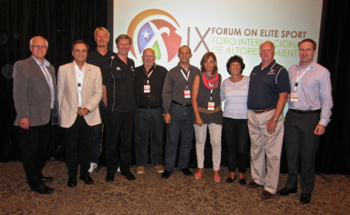 The focus of the 2015 Forum on Elite Sport will be management and leadership in international high performance sport centres. Over the course of the Forum, we aim to answer the following questions: How do we better develop present and future leaders of high performance centres? How do we better equip the ASPC members and high performance centre leaders in their respective locations to be even better leaders? What skills, knowledge, abilities and tools can be offered that will contribute to the personal and professional growth of high performance centre leaders? How do we elevate the efficiency, effectiveness and impact of our centres through a focus on developing strong leadership? 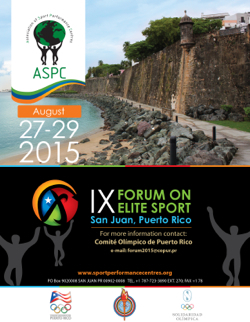 14:00 to 17:00 - ASPC New Website, Database tutorials and SAT. The role of performance centres is bigger than offering "a space to train". Managing relationships is a challenge most leaders of performance centres are likely to share. -John Underwood – nutrition, rest, recovery – how Training Centres can impact performance. Understanding the defining features of a highly effective ‘Performance Pathway’ and the relationship to success in an elite sport environment. The presentation will discuss the CDS performance environment, constraints and the various contributors to the daily demand of performance. In addition we will outline systems and processes we have put in place to manage performance, risk and distant management.